Hi all, hope everyone had a nice weekend. I played a hand last Thursday that has gotten a lot of discussion between some friends and I and I am finally getting around to doing the analysis on it off table. 1/3 NL at MGM National Harbor, Hero ($851) is dealt : : on the button and is the effective stack against the main V in this hand. UTG ($200) limps and HJ (1.2k) also limps. Hero makes it $20 to go on the button and only HJ calls. HJ is a known bad reg who is extremely passive preflop, is probably only raising QQ+, AK and AQs and is limp calling extremely wide. V is also a serious calling station up to the river. He will fold on the river but is rarely going to give up on a flop if he has any piece or any draw. This knowledge about him informed a lot of my decision making during the hand. V also is very willing to bluff postflop; he's an odd player given how passive he is pre but turning up the aggression post. 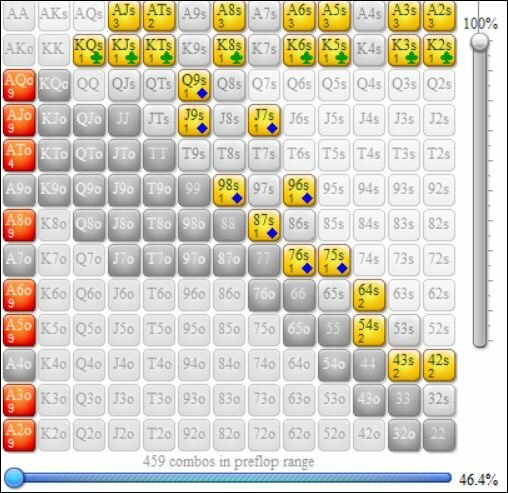 So on this flop, I elect to c-bet for value, knowing that based on how wide V calls, I am probably ahead of 50% of V's range. Hero bets $25 and V calls. Here is where things get a tad more interesting. V decides to lead the turn for $25. V donks fairly often both for value and as a bluff. He often uses the same bet from the previous street on the turn as well, so the sizing, while on the smaller side, does not give me a ton of insight into his hand. He's been known to lead turn for a smaller sizing and bomb the river. Most of the time I would say this river is a brick but against this V he actually picks up a few combos of two pair with this river. V elects to check. So off table I think this is a good spot to turn TT into a bluff, although I won't say what I did on table. 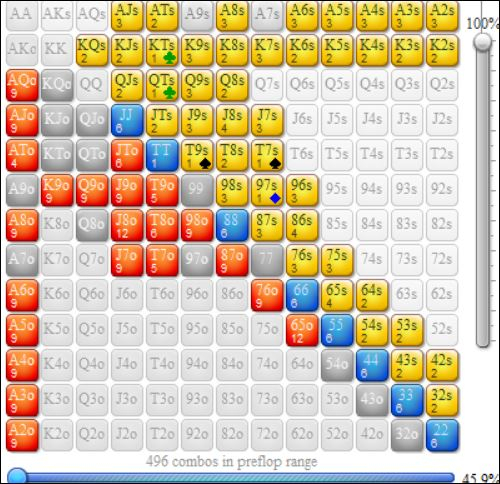 1) Is the flop decision to c-bet sound? A few friends and I had an interesting conversation about this and would like to hear from some others. 3) On the river, should we take our showdown value or turn TT into a bluff? 4) Any feedback on the post itself? Some of @Red 's comments recently inspired me to put some more work into this hand than I previously had done. I think that your preflop range for villain is too wide. I don't think that he is likely limp calling with as many of the off suit gappers that you assigned. Aside from that, I think that the flop play was fine. I think that you're getting a good price on the turn, but I would only call if my plan is to float and bluff the river. As played, I don't like turning your hand into a bluff because by you not raising the turn yourself, you appear capped. What could you credibly rep that just flatted turn and now wants to bet large on the river? I would likely just check it back and be shown some weak ace or weak king. I think that your preflop range for villain is too wide. I don't think that he is likely limp calling with as many of the off suit gappers that you assigned. I certainly agree it is a wide range but V is involved in 50% of hands about, limp calling most of them. I believe the range is probably pretty close. We can quibble on T7o or 97o but this seems very realistic based on this particular V.
As played, I don't like turning your hand into a bluff because by you not raising the turn yourself, you appear capped. What could you credibly rep that just flatted turn and now wants to bet large on the river? I would likely just check it back and be shown some weak ace or weak king. This is a good point, I did not address what I would rep; I can't edit the original post any longer but based on what I just ran through Flopzilla I can credibly rep 79 combos of top pair or two pair. I would not have any sets here but neither does V. I have more combos of 2 pair than he does (given I think he has 0) and I have all the strongest top pairs in my range and he does not. So while I am capped in terms of not having a nut advantage over my opponent, I still believe I am less capped than him. But regardless, thanks for pointing that out as I did not address that at all which is a big oversight. On the flop this is a standard bet....a loose vilain who raises AK and maybe AQ has an ace less then 25% of the time....he has some equity...and if he fold KJ or whatever it not a bad result....QQ KK maybe check backs..
Against a loose maybe cally player I probably just give it up on the turn. I'm gonna give here some first comments. If I find time this week (pretty busy unfortunately - replying your from work), I'll break your hand down as well. I'd usually rather check TT, because we block T9 and T8 - a too big chunk of the range of a more "normal" Villain. But considering the wide range you assigned to Villain, the expectation to be called by even a naked FD, and that we don't hold , I'm on board for the c-bet. Here, I'm not a big fan of flatting. is really not a card for Villain. Yes, it opens bckd FD, but having block some combo draws he could have for him to improve (like Td9d). Mostly, he get KcXc for pair+ FD or a gutshot+FD. I still notice that Villain is still very wide by donking based on your assumption, with weak combo like . On the value side, Hero has KK, AK when Villain cannot have (based on your analysis). Bottom line: only calling on turn... I'm not a fan. We allow V to see a way too cheap river card with all his draws. Also considering his range (and I don't expect such V to donk/fold that often), I think raising turn still allows us to scratch value (TT beeing ahead of the range he could call). Last but not least: as said by @osirus0830 , by flatting you cap your range. We turn TT into a bluff catcher. Not bad per se if we think V will fold too much to a raise but still fire river often. But then, it will be hard to bluff river. Here I'm not such a big fan of raising TT for bluff. Our range is capped, and TT isn't the top of it (I expect a meh AX). So we don't have that much strength, and it's hard to rep any improved strength on a brick. Hero will have some busted draw as well, like QdTd. If so, then V could have even more incentive to call thinking we called a draw on turn and now busted we try to steal. Even if V has a wide range after the check, what would he call with ? Any busted draw will insta fold. He could be call with bad AX, busted KX draw, KX and 9X : against these, TT only win against 9X. Also note that TT block T9 (what we would be called by) but not really AT or KT (which we don't want to be called by). As I see on your flopzilla diagramm, V has a ton of AXos when only few KX and 9X. So he has a lot of combos to bluff catch with... And very few TT can target for thin value. How often will V c/r ? I don't expect that often considering how passive you described him, but if he spazzes out, we have to fold our TT stab. And I don't want to fold TT since we have SDV. So all together, on your river, I prefer to check behind and realize my equity and SDV than turning TT into a bluff. For bluff, I think we have better combo to bluff with - esp. those without SDV - , like QcTc. For thin value, I prefer using the meh AX we call turn with, as we win against all KX and most of AX V hold. We could make a case of betting to make V fold and hide our hand... but then, I prefer to raise turn than bet river. As said, I'd break your hand down. I took some time today and here is my own analysis. Even if V is loose-passive, I don't expect him to limp/call OOP with a too wide range. I don't expect V to have trashy off-suit combos except connector. I'm but on board with trash/meh suited combo. This range could be wider or tighter based on his tendencies and your history. Usually passive player tend to c-r sets. They tend to only c-r sets. Some other will donkbet with any TP. As you you presented V as ultra passive, I won't give him any donkbet or c-r range but put all "piece of the flop" as a x/c range. Aka any pair or draw stay in his range - a 68% continuation range / 225 combos. 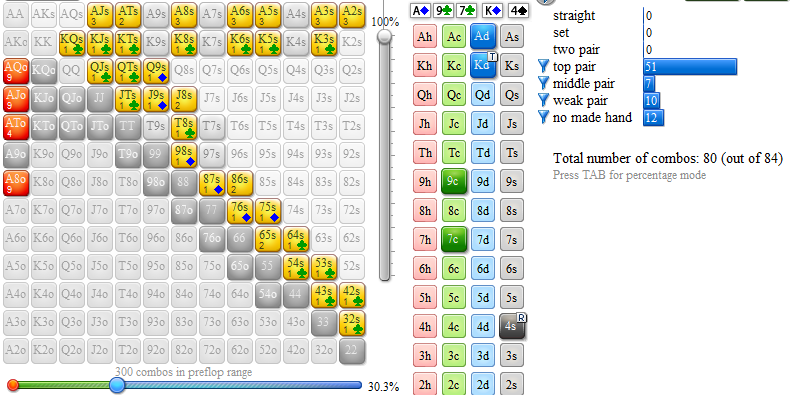 (I didn't use HoldEQ, so it's only an educated guess) If we aren't too crazy preflop, we have a nice range advantage. And we shall have many if not all nut FD, which are good to bet and could be "freeballing" against lower FD. So I think we should bet this flop rather regularly. So I think we can c-bet this board fairly regularly. Now do I want to bet TT ? I think it's ok only if V is staying very loose and very passive. 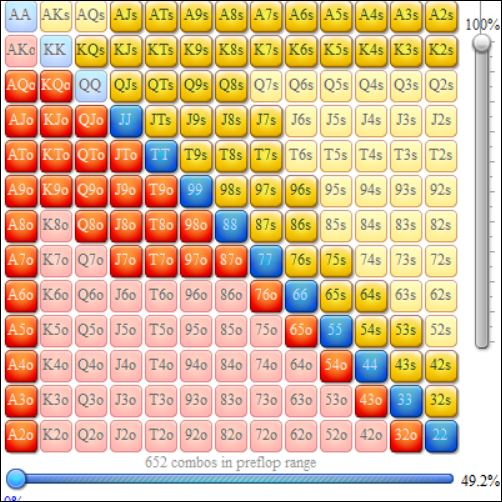 We also know which cards to avoid and use our position at best to either bet or check. We but really need V to easily continue (too loose/station). As we block T9 (and T8), this means either V has too many lower combos (like 98, 76, etc.) or will continue more often with combo which beat us (AX) or with too much equity (like QcJc). At least we don't hold . We still have , so we don't have the best TT combo (ThTs), but at least we don't block combo draws like Tc8c. Also note that TcXc combo V can hold have great equity (between 45 and 55%). So even if we want V to have it, we also have to dodge some cards in the deck because of V potentially holding the "golden card". Hence TT is for me here between thin value and semi-bluff. I'd not always bet TT, but betting some times. I'm on board c-betting TT this time. OP says that V is often using the same bet size and there is a mix of made hands and bluff. Considering V called flop, OOP, he has a piece of the board. So a bluff shall be a draw. Considering there are now 2 FD, I don't expect V to bet OESD (which is blocked too), but only FD or combo FD. I agree with OP that V shall not have many 2P or sets here. Many of them could have x/r flop. If V intended to take the lead on the turn, then often 2P/set are trying to avoid being outdrawn : to make draws fold (or charge them for the max). So a 25$ into almost 100$ is not a bet sizing I'd expect expect. Now V may have a bet sizing issue and use a bad sizing - meaning we couldn't discard 2P or sets. Also I've noticed (own experience + comment from Jonathan Little) that bad players tend to call flop and donk turn with marginal holding (like TPwK). Let's take the assumption that V is donkbetting with V donk with TP + any FD. In this situation, V donk 85 combos: 54 TP and 39 FD ( and ). 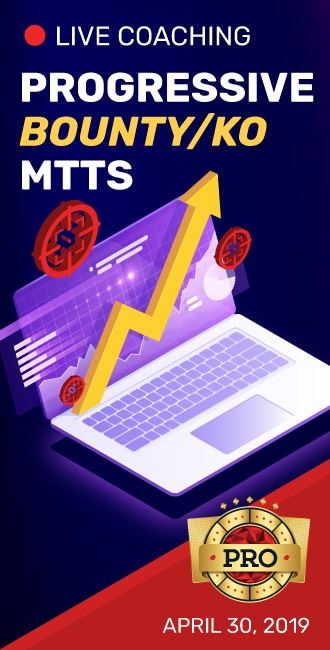 Against this range TT has 21% equity. So a call is still +EV because calling 25$ to win 147$ is still 17% pot odds. So we have the right odds to call and see a river. But... once on river, it will be hard to navigate. Especially if V is known to lead turn small ("same bet") and bomb the turn. Calling turn to folding a river bomb makes no sens; calling turn and calling a river bomb +EV means V is also firing his draws. Which is not totally out of the question considering V is presented as super passive pre but pretty bluffy-aggro postflop. So we could call with the intention of calling any non river. The problem is also: if we have good odds to call and brace for the river, we also give V the opportunity to draw with a good price. If V has that many draws, then I really not fan of letting him deciding how much will be the turn - and it being a price he likes. Now we have to see that is really not a good card for V. Hero improved with KK and AK which are expected to bet with (if we bet TT, then we shall bet KK as well, right?). The only time V improved is only with . In fact, V only really likes on turn any 5, 6, 7, 8, 9, J and . A brick is rather neutral (better for made hand / RA, aka Hero) and a high card is better for Hero. When V is betting that many draws and meh AX, I think we can use our range advantage and turn TT into a bluff as raise/fold. Also if V call, he shall not have initiative on river, and this can go check/check : by raising we have turn FE and initiative for pot control or bet on river. H shall raise to the pot to really put pressure and have FE... something like 140$? 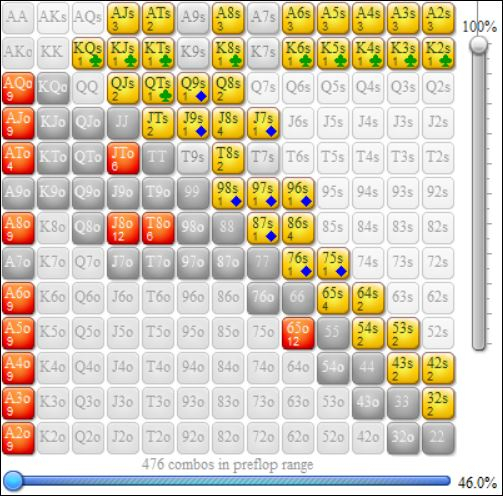 In this case, Hero needs [140/(97+25+140) = 140/262 =] 53% of V folding to be +EV just by raising. I doubt V will fold that much, esp. when he is considered as a calling station up to the river. But still, he will fold a part of his range, and we still face many draws we are currently ahead - and we have position and now initiative to handle the river. Also, very weak AX have then a hard time, as they should be between dominated and drawing dead. 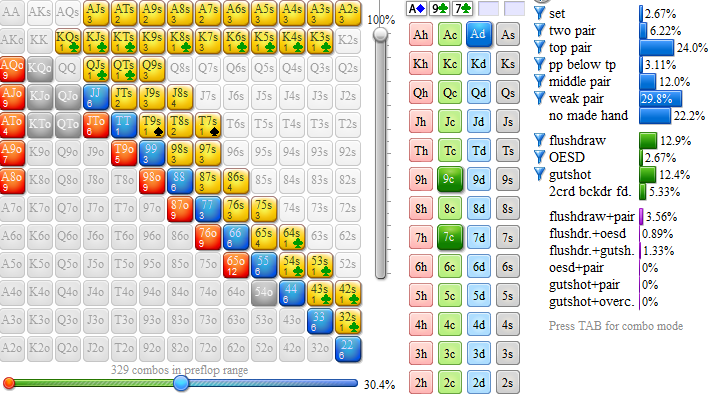 Calling with A4s or A8o required V to suppose H is bluff raising often - often enough that bluff catching is then +EV. So, raising really put V in a tough spot - under the assumption he is donkbetting any TP and any FD. Also, if V is rep a TP as counterpart for his draws, he can't let him have initiative. Otherwise even on a river brick and considering V will fire 100% of his turn range, we are still behind because of these weak TP. And raising river (trying to bluff with TT) after calling turn doesn't make much sense - looks too fancy - and might not get enough FE to bluff against a station, even if V is less of a station on river than on earlier streets. I think I prefer a raise than a call on the turn - because we have range advantage and helps our range more than V.
Also we keep initiative and range advantage, which will be needed if we want to bluff river. I prefer the call if turn is a brick or a card for V's range. (I wouldn't call often on a card for V's range, but price is great, V is loose-bluffy and a good card for V will often helps TT to get a gutshot or OESD). Now that we call, river is a brick and pot is 147$ for 781$ remaining. When V checks, I think we can discount great made hands, which would have bet for value. Stay then busted draws and TP. Now I don't really see the point of betting TT. V has 51 combos of TP (maybe fewer if he thin value his bets TP) and 29 combos of worst pairs and none made hands, including 7 KcXc. Betting with TT... really hard to say. If V is able to fold up to his worst AX, then I could be on board betting TT for bluff. If V is not believing because of the turn check (thinking you then don't have AX), he could call pretty wide and you just hang yourself by making worst hands fold. We could try to bet low to very thing value against 9Xs, 7Xs and 4Xs, but ha.... reaaaally thin. And a small bet (1/4 pot bet size? 1/5?) could be raised just because it looks weak and we would be pushed off our hand - V is still described as postflop aggro/bluffy - , which we don't want to. So with these assumptions, I prefer to check behind a realize TT's equity for cheap. Might lose often, but it's ok since the turn call didn't need us to win anything on river to be +EV. Now I put V's range like that because you gave him KXs and I also tend to play these combo. But now if we change his range, saying he won't limp/call with KXs often, but he likes SC, suited gappers and double gappers more than suited high-low card, things are different. As you see, then almost don't play any role for V has he has only 3 KcXc possible. Also there are 8 more FD in this scenario. So more FD and fewer combo FD. In the 1st and even more in the 2nd scenario, I find reason to raise the turn. Even more in the 2nd scenario. Also being rather lagy-bully myself, I usually raise weak donkbet to make them respect my bets. (I but pay attention in case it could be a trap). On the river, in both scenario I prefer to check behind and realize my equity. Thin value bet could be made against a more passive Villain, but as we don't want V, active postflop, to spazz and raise, checking is my prefered line. Based on V's description, my analysis also shows that a bet is good. I'd usually prefer a check (with most of my range for adelayed c-bet) if V is more tight, but HJ is loose and a station. If V is able to fire many bluffs, it's way to nitty to fold. Even against an unknown I'd wouldn't fold. The only question here is: raise or call? Because we have range advantage and we want to keep it for an eventual river bluff, I prefer to raise more than to call. If V is able to fire wide and many busted draws, then I might prefer to call with the intention to call any rather safe river, whatever the sizing is. As said, I prefer to realize our SDV. 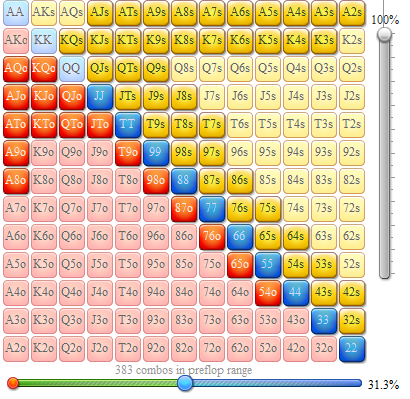 After calling turn, it's hard to make V fold enough AX to be able to turn TT into a +EV bluff. 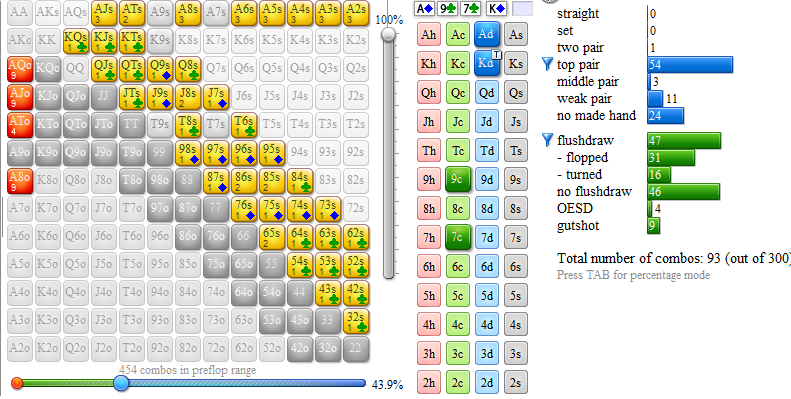 Also we still have decent SDV against busted draw with 9X, 7X and 4X. @Red I cannot wait to read this in detail. Thanks for all the feedback. I am going to dig through this in detail Saturday afternoon. I know my preflop range for V sounds a bit excessively wide, but he limp/calls absolute trash. Actually had a very similar situation with the exact same V last night. He donked the turn, I raised my draw as the turn was a : but I remember this post, thought that K was pretty solid for my range (and it gave me the draw for the river) so I raised it up, he folded his weak middle pair. Not to be too results oriented but the speed with which he ditched hit sort of helped drive the concept home. Def need to do some study on facing donk bets as I've been seeing a ton of them lately. Again, thanks for the feedback. Will take a detailed look tomorrow. Don't want to short change that level of detail since I only have about 45 minutes before I leave for the casino. I mean, I hope villain is a clever player and just has AK here sometimes, but yes, you can put this all to bed by understanding what hands are in your range and in his and responding accordingly.